The U444-06N-H4GU-C USB 3.1 Gen 1 USB-C to HDMI DisplayPort Alternate Mode External Video Adapter supports USB DisplayPort Alternate Mode for displaying audio/video signals on an HDMI monitor, television or projector via your computer, laptop or tablet's USB-C port. It's an ideal tool for multitasking, editing documents, giving presentations at trade shows and conferences, or watching movies and playing video games.No software, drivers or external power supply is needed. Connect the adapter's USB-C male plug to the USB-C port on your device. 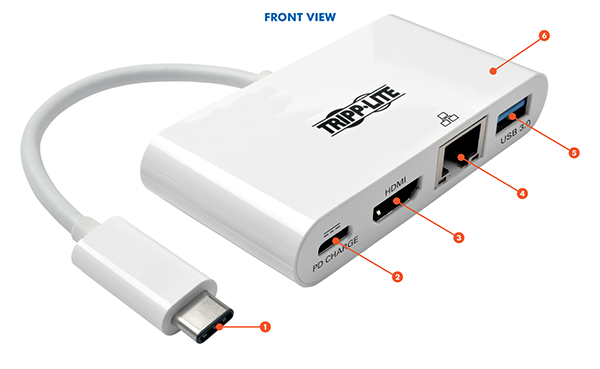 Then, connect the adapter's female HDMI port to a monitor using an HDMI cable (such as Tripp Lite's P568-Series) to enjoy full HDMI video and audio. The U444-06N-H4GU-C supports Ultra High Definition (UHD) video resolutions up to 3840 x 2160 (4K x 2K) at 30 Hz.The U444-06N-H4GU-C includes an RJ45 Gigabit Ethernet port. Connect to a network with a UTP cable, such as Tripp Lite's N201-Series Cat6 cables, and enjoy true 10/100/1000 Mbps Ethernet speeds.The USB 3.1 hub port connects USB-A peripherals, such as a thumb drive or printer. It's backward compatible with previous USB generations, and supports USB 3.1 Gen 1 data transfer rates up to 5 Gbps.The USB-C charging port supports power input up to 20V 3A (60W). It powers the device that the U444-06N-H4GU-C is plugged into, as well as a peripheral plugged into its USB-A port, by connecting the charging port to a USB-C wall charger. Send audio/video to an HDMI monitor. Power and charge your laptop. Connect to a Gigabit Ethernet network. Because just one USB-C connection provides four different ports, you don’t need multiple adapters while on the go. This docking station is also bus-powered, so you don’t have to travel with the weight of a separate external power supply. With a footprint similar in size to a credit card, this portable docking station fits almost anywhere. This docking station supports USB DisplayPort Alternate Mode (Alt Mode) for carrying digital audio and ultra high-definition video to an HDMI monitor, television or projector. It supports video resolutions up to 3840 x 2160 (4K x 2K) at 30 Hz. Extend video across a second monitor. Share audio/video in a conference room, classroom or auditorium setting. A USB-A port provides a place to connect a USB peripheral, like a flash drive or a USB mouse. Or, you can connect a printer with a USB cable when a wireless connection isn’t feasible. The docking station supports USB 3.1 Gen 1 data transfer rates up to 5 Gbps. It’s also backward compatible with previous USB generations. Limited USB-C ports can force you to choose between connecting a peripheral and charging your laptop’s battery. The USB-C Power Delivery (PD) port powers and charges your laptop without affecting the other connections. Your laptop’s wall charger connects to the USB-C PD port, which supports power input up to 20V, 3A. Convert your MacBook or Chromebook into a powerful and portable workstation. Use the USB-C port on a laptop or tablet to send audio/4K video to an HDMI monitor, add a USB peripheral, charge your device and connect to a Gigabit Ethernet network. When Wi-Fi isn’t available, use the RJ45 port to support a Gigabit Ethernet connection.